Deasy claims to have earned his PhD at the University of Louisville (UL) in the College of Education. The Dean of the College at the time was one Robert Felner, now serving a jail term of 63 months for a variety of frauds committed against UL — and other universities. 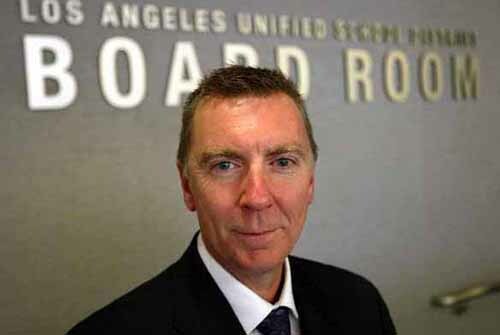 The controversial history of John Deasy (and the fact that his quickie “PhD” was awarded by a University of Louisville dean who later went to prison for fraud) seems to be no barrier to the top job in Los Angeles. Deasy has the support of both the Gates and Broad foundations, and that’s enough for Los Angeles Mayor Antonio R. Villaraigosa. One charge against Feiner was the misappropriation of a $649,000 federal grant. In total, Felner was convicted of stealing $2.3 million in research grants. He was ordered to pay UL $51,000 and the University of Rhode Island $1.3 million. Felner resigned from UL in 2008. He was sentenced on May 17, 2010. A UL investigation of the Deasy PhD did not condemn the practice. James Ramsey, UL president, who had turned a blind eye to Felner’s notorious corruption (the faculty gave Felner a “no confidence vote” in 2006, but he served at least two more years at UL with Ramsey’s full support), gave his nod to the “blue ribbon” investigation. However, the UL handbook clearly states that a PhD candidate must spend two years on campus. More, it usually takes most students a minimum of three years. In addition, UL rarely allows a student to transfer more than six credits. Some may find it odd that Deasy did not vigorously defend a scintillating body of work and an illuminating dissertation. His willingness to do what he is told is equally interesting. In September, 2008, during an investigation done by Maryland Gazette.net, Deasy refused to release his academic records. After meritoriously buying his PhD, Deasy went on to work with the Gates Foundation where he focused his eyes on teacher evaluations and merit pay. He also served as superintendent in Coventry Schools in Rhode Island, Prince Georges County, and Santa Monica. He was a Broad and Annenberg Fellow. The United Teachers of LA first met Deasy when the Los Angeles Times published their infamous “value added teaching” project which sought to link teacher effectiveness directly to test scores. Deasy heartily supported the effort, demanding that UTLA re-open the contract to include the measurement for matters of pay and promotion. UTLA rejected his demand. UTLA, like other big districts, is now engaged in an internal election battle that will likely determine the direction of the union, that is, more retreats or a ferocious effort to emancipate education from the ruling classes. So Felner, Deasy’s co-conspirator is in jail but Deasy always seems to land holding the bread with the buttered side up. Of some interest is the fact that the Gates press release on his hiring (issued at the same time the scandal over his phony Ph.D. made headlines) and later Philanthropy journal article made no mention of this degree. Maybe Deasy’s very short tenure at Gates was just the holding pattern for Deasy to make Los Angelesa Gates model pay-for-performance school. John Deasy left a trail of corruption in PG county which involved the the current supritendant Dr. William Hites Jr. It’s sad such characters are allowed to lead and manage such a big amount of money like this. The tax payers are the ones losing here. Just curious-If Felner was convicted of stealing $2.3 million in research grants, Why was he only ordered to pay UL $51,000 and the University of Rhode Island $1.3 million? Sounds like he got away with a cool million! Is any information available about Deasy’s actual dissertation? No wonder he fits right in! Where is the Los Angeles Times story? Where is the UTLA outrage? Really? I wrote a book describing the corruption in our schools called White Chalk Crime: The REAL Reason Schools Fail, which explains exactly why they would hire someone like Deasy in a leadership role. While they trash quality educators who know what they are doing, they bring in EducRAT$ whose skill is in the latter part of their name. The fact they have no pedagogical skills is irrelevant when the goal is raiding our schools for money and power. This article also describes exactly why our schools are failing – people focused on money and power rather than children and education are at the helm. The problem is that our society is so slow to believe people could be this bad. It took them years to finally get what the priests were doing and even longer to get that those running our schools could be criminal-like. All we can do is keep on exposing it. And if you want to read a book that exposes the lack of concern for children in the Chicago Public Schools specifically, read When Teachers Talk, by Rosalyn Schnall. Eventually enough people will connect the dots and their outrage will make White Chalk Crime stop. Unfortunately for the children and the teachers being abused for trying to really education children, this is going to be a while because the cover of motherhood and apple pie goes along with those running our schools. Visit WhiteChalkCrime.com and EndTeacherAbuse.org to join teachers, parents and citizens who have had enough.